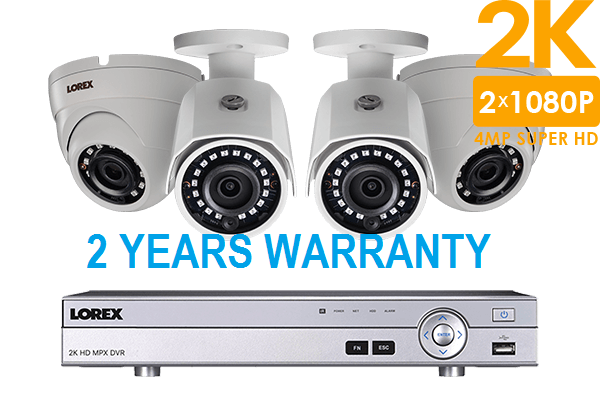 Experience a new way to monitor your property with this exciting 2K SuperHD home home security system from Lorex. 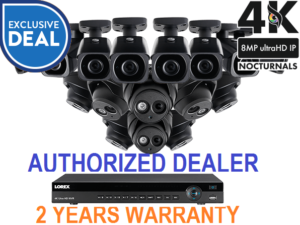 The 2KMPX422D features a top-of-the-line 4-channel DV800 HD digital video recorder (DVR), two LBV4711 bullet and two LEV4712 dome security cameras. Each of these cameras are fully weatherproof and have excellent night vision capabilities. This security camera is capable of recording a 2K pixel resolution of 2688 × 1520 – that’s almost double the number of pixels of 1080p. This heightened resolution will not only produce stunningly detailed video, it will also allow for greater digital zooms while reviewing recorded video so you can continue to see important details even if they are far away. The camera’s wide 85° angle lens is also perfect for large areas or doorway monitoring. This DVR has three different recording options to suit your needs. You can record footage continuously, during scheduled times, or when movement is detected. 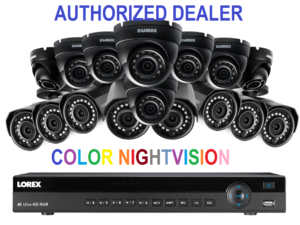 These options can be customized with each of your security cameras, which means you can have your most important camera recording all of the time while lower activity cameras can be programmed only to record on motion. 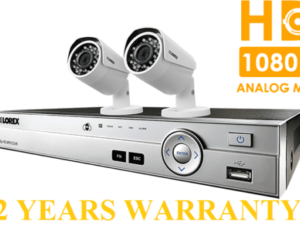 To be safe, this DVR includes a pre-recording function that goes along with the motion recording option. This feature will go back to record the five seconds before the motion is detected, so you never have to worry about missing those first vital moments. View your entire home security system from virtually anywhere in the world by linking the 2KMPX422D’s high definition DVR to our hassle-free cloud solution. Easy to set-up and without recurring fees, the FLIR Cloud™ app will consolidate your home security system from a mobile device (or computer). Remain connected to your property at all times with motion triggered push notifications and instant email alerts with snapshot attachments. Our FLIR Cloud security camera app makes monitoring your Lorex security system easy. Available for iOS, Android, Mac and PC, FLIR Cloud lets you view your entire security system from anywhere in the world. Monitor your property in real time and watch recorded footage from wherever you are. 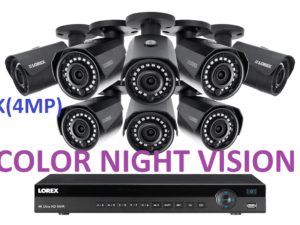 Rest assured knowing that your security camera can see up to 150ft / 46m with the help of some ambient lighting or 100ft / 31m in total darkness. This camera also uses SmartIR technology to ensure that the infrared lights don’t over-expose faces or objects that get close to the camera. Install this durable security camera wherever you need it most – indoors or outdoors. It comes with the highest IP rating available (IP67). So you can count on all-season security monitoring for years and years, even if the camera is directly exposed to the elements. An auto-recovery feature will automatically reboot your DVR once it regains power. This means that you don’t have to do a thing – your system will simply start recording again within minutes. A Watch Dog function is also built-in to this DVR that continuously monitors the system for potential system errors. If it detects a critical error, Watch Dog will automatically reboot the system, which helps ensure system stability, keeps your cameras recording, and prevents future system failures.